The Aichi D3A Type 99 Carrier Bomber (Allied reporting name "Val") is a World War II carrier-borne dive bomber. It was the primary dive bomber of the Imperial Japanese Navy (IJN) and was involved in almost all IJN actions, including the attack on Pearl Harbor. Aichi D3A1 from carrier Akagi. Aichi D3A1 "Val" dive bombers prepare to take off from a Japanese aircraft carrier during the morning of 7 December 1941 to attack Pearl Harbor. Aichi D3As from Shōkaku return to their carrier after attacking the U.S. carrier Enterprise during the Battle of the Eastern Solomons in August 1942. 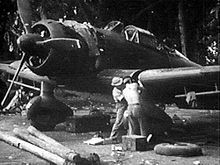 The Aichi D3A was the first Japanese aircraft to bomb American targets in the war, commencing with Pearl Harbor and U.S. bases in the Philippines, such as Clark Air Force Base. Vals sank more Allied warships than any other Axis aircraft. In mid-1936, the Japanese Navy issued the 11-Shi specification for a monoplane carrier-based dive bomber to replace the existing D1A biplane then in service. Aichi, Nakajima, and Mitsubishi all submitted designs, with the former two subsequently being asked for two prototypes each. The Aichi design started with low-mounted elliptical wings inspired by the Heinkel He 70 Blitz. It flew slowly enough that the drag from the landing gear was not a serious issue, so fixed gear was used for simplicity. The aircraft was to be powered by the 529 kW (709 hp) Nakajima Hikari 1 nine-cylinder radial engine. The first prototype was completed in December 1937, and flight trials began a month later. Initial tests were disappointing. The aircraft was underpowered and suffered from directional instability in wide turns, and in tighter turns it tended to snap roll. The dive brakes vibrated heavily when extended at their design speed of 200 knots (370 km/h), and the Navy was already asking for a faster diving speed of 240 knots (440 km/h). The second aircraft was extensively modified before delivery to try to address the problems. Power was increased by replacing the Hikari with the 626 kW (839 hp) Mitsubishi Kinsei 3 in a redesigned cowling, and the vertical tail was enlarged to help with the directional instability. The wings were slightly larger in span and the outer sections of the leading edges had wash-out to combat the snap rolls, and strengthened dive brakes were fitted. These changes cured all of the problems except the directional instability, and it was enough for the D3A1 to win over the Nakajima D3N1. In December 1939, the Navy ordered the aircraft as the Navy Type 99 Carrier Bomber Model 11 (kanjō bakugekiki, usually abbreviated to 艦爆 kanbaku.). The production models featured slightly smaller wings and increased power in the form of the 746 kW (1,000 hp) Kinsei 43 or 798 kW (1,070 hp) Kinsei 44. The directional instability problem was finally cured with the fitting of a long dorsal fin-strake which started midway down the rear fuselage, and the aircraft actually became highly maneuverable. Armament was two forward-firing 7.7 mm (0.303 in) Type 97 machine guns, and one flexible 7.7 mm (.303 in) Type 92 machine gun in the rear cockpit for defense. Normal bombload was a single 250 kg (550 lb) bomb carried under the fuselage, swung out under the propeller on release by a trapeze. Two additional 60 kg (130 lb) bombs could be carried on wing racks located under each wing outboard of the dive brakes. As the war progressed, there were instances when the dive bombers were pressed into duty as fighters in the interceptor role, their maneuverability being enough to allow them to survive in this role. In June 1942, an improved version of the D3A powered by a 969 kW (1,299 hp) Kinsei 54 was tested as the Model 12. The extra power reduced range, so the design was further modified with additional fuel tanks to bring the total tankage to 900 L (240 US gal), giving it the range needed to fight effectively over the Solomon Islands. Known to the Navy as the Model 22, it began to replace the Model 11 in front-line units in autumn 1942, and most Model 11s were then sent to training units. One D3A is currently under restoration at the Planes of Fame Museum in Chino, California. There are two unrestored D3As on display at the National Museum of the Pacific War in Fredericksburg, Texas. ^ a b Chant 1999, p. 16. ^ Note: This code name was applied mid-to-late 1943; more often the D3A was referred to as the "Type 99 navy dive bomber" by Allied forces. ^ Angelucci and Matricardi 1978, p. 142. ^ Worth 2001, p. 170. ^ Casey 1977, p. 87. ^ Francillon 1979, p. 272. ^ Francillon 1979, pp. 272–273. ^ Francillon 1969, p. 24. ^ Parshall and Tully 2007, p. 80. ^ a b Air International December 1987, p. 289. ^ Air International December 1987, p. 288. ^ Francillon 1979, p. 274. ^ Brown 1990, pp. 60–125. ^ Parkin 1995, p. 198. ^ Parkin 1995, p. 251. ^ Francillon 1969, p. 25. ^ Air International December 1987, p. 290. ^ "Restoration Projects". Planes of Fame Museum. Retrieved: 7 December 2010. ^ Taylan, Justin. "D3A2 Model 22 Val Manufacture Number 3357 Tail 582–248". Pacific Wrecks. Pacific Wrecks Inc. Retrieved 19 August 2016. ^ Taylan, Justin. "D3A2 Model 22 Val Manufacture Number 3105". Pacific Wrecks. Pacific Wrecks Inc. Retrieved 19 August 2016. ^ Francillon, Rene (1979). Japanese Aircraft of the Pacific War. London: Putnam & Company Limited. pp. 271–276. ISBN 0 370 30251 6. Brown, David. Warship Losses of World War Two. London: Arms and Armour, 1990. ISBN 0-85368-802-8. Casey, Louis S. Naval Aircraft. Secaucus, New Jersey: Chartwell Books Inc., 1977. ISBN 0-7026-0025-3. Chant, Christopher. Aircraft of World War II – 300 of the World's Greatest Aircraft 1939–45. London: Amber Books Ltd., 1999. ISBN 0-7607-1261-1. Eden, Paul. "The Encyclopedia of Aircraft of WWII".London:Amber Books Lt., 2007. ISBN 1-904687-83-0. "Pacific Predator... the Aichi Type 99". Air International, Vol. 33, No. 6, December 1987, pp. 285–290. Bromley, UK: Fine Scroll. ISSN 0306-5634. Parkin, Robert S. Blood on the Sea: American Destroyers Lost in World War II. New York: Sarpedon Publishing, 1995. ISBN 1-885119-17-8. Richards, M.C. and Donald S. Smith. "Aichi D3A ('Val') & Yokosuka D4Y ('Judy') Carrier Bombers of the IJNAF". Aircraft in Profile, Volume 13, 1974, pp. 145–169. Windsor, Berkshire, UK: Profile Publications Ltd. ISBN 0-85383-022-3. Roscoe, Theodore. United States Destroyer Operations in World War II. Annapolis, Maryland: United States Naval Institute, 1953. ISBN 0-87021-726-7. Tagaya, Osamu. Aichi 99 Kanbaku 'Val' Units of World War 2. Botley, UK: Osprey Publications, 2007. ISBN 1-84176-912-6. Worth, Richard. Fleets of World War II. New York: Da Capo Press, 2001. ISBN 978-0-306-81116-6. Wikimedia Commons has media related to Aichi D3A.